We here at Brazen Tool Co. have been very impressed with your acts of heroism. As such we would like to offer you a position that, we believe, will be mutually beneficial. We've recently come out with a new line of rubber mallets that we would like you to represent. Ideally, we'd have you do some commercials, for which you will be paid handsomely. Our mallets are made from a brand new substance the boys in the labs are calling: Mjolnir Rubber. Though for the purposes of marketing, we'll be going with the much more phonetic friendly branding of "My Ole Near-Rubber Mallets." We realize of course that with your status, money isn't everything. God(s) knows we wouldn't dream of having you recommend a product you yourself wouldn't use. You should be receiving a small package either the same day or shortly after this letter. Inside you will find two of our hammers. The standard one is the main mallet we want you to get comfortable with. The other one you'll note, is pink. We've been thinking of marketing our line to women. Our polling indicates that you elicit a strong reaction from women aged 12-74. We were thinking of a campaign along the lines of "I Can't Believe It's Not Rubber," but that's a detail we can hammer out later. Our design, flawless, but the style and comfort, might just have you hanging up that old, heavy, square deal you've been carrying around. I know when one of our previous spokespersons, Beta Ray Bill tried one of our earlier models, he never switched back. We're confident, once you've tried our mallets, you'll agree that we really nailed it here. 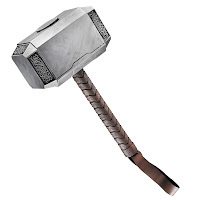 I look forward to hearing from you once you've had a chance to give the new hammer a twirl. Thor wielding a pink hammer. That would be funny! I could see a whole line of marketing to superheroes. Another funny letter TS! "strong reaction from women aged 12-74"
It be the Golden Locks flowing!